In this new series we look at notes taken unedited from authors’ journals, then learn how they’re worked into stories, novels and other writing. Today we read field notes from short story writer and novelist Elizabeth Eslami. 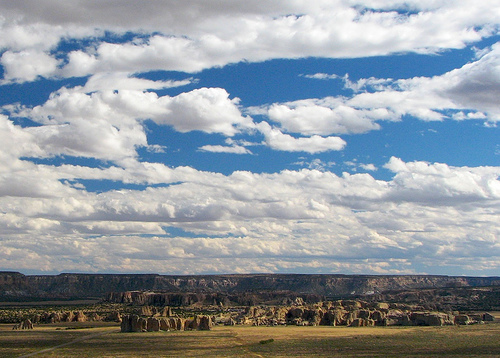 Sixty miles outside of Albuquerque, I’m standing on the dry table of Acoma Pueblo, having joined a tour with other white people, our skin blistering into a plastic doll color. We move like clouds, slow, unaffected, led through real people’s museum lives. I think there’s a story here, turning itself over in the dust, maybe a knot of stories — Acoma stories, whites with Acoma stories. I never expected it to cut into me. The meshing and clashing of cultures, the Spanish forcing religion upon them. The church with its graves upon graves, built and buried in layers, a rising wall of false heads… All coated in sand, baked like their ovens. This is everybody, most of them white. There are a lot of them, small and tall, fat and pale, but if you are looking down at them from the pueblo, they just look like golf tees lined up, brittle and wooden. At Acoma, a child held my hand and, like an antelope, guided me down a steep stone staircase, a narrow fissure carved by ancient waters, but she also guided me down into the story. I thought the words: “miracles, false and real.” They came and settled into the fissures of my brain, and I left them there. Sometimes there’s a story before the story, and sometimes, one story splinters into more. Don’t be afraid of that. When something breaks, it makes a lot of noise. Just shut up and listen. Find the place, dip into it, and then pull back, shards of other people’s stories, their voices, their wounds, sticking in you like glass. That part hurts a bit, someone else’s life under your skin. That’s okay. Other story-shards might fall away, ones you thought were important. Perhaps you’ll pick them up and use them later, or maybe you won’t. Keep pulling back, but leave the dust in your eyes, the cuts on your hands. Then, finally: blink, look away. Write your story. Because now it’s your blood on the page, recording their voices. Their cinnamon fry bread on your tongue. Their antelope-child guide’s warm hand in yours. Listen. Get dirty. Bleed. Elizabeth’s new novel Bone Worship can be pre-ordered at Amazon.